The Angel Whisperer Official Site - Home Study Angel Intuitive Certification Program Accredited Program﻿ Study in the comfort of your own home! Study in the comfort of your own home! Work at your own pace! This is a certification program designed for anyone who would like to expand their awareness, healing and connection to the Angelic Realms, for those interested in using these tools in their life: as well as serving and assisting other on similar paths. Audio CD's, Angel Intuitive Practitioner Course Materials Binder, deck of angel cards, accredited certification, spiritual healing sent throughout the entire process, and a copy of Dr. Kelli's book, Angels Are Always All Around You. Includes if necessary, one private session with Dr. Kelli to discuss any questions or if preferred, email support. 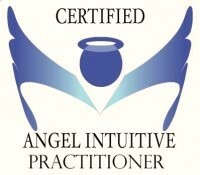 Once all requirements of the ﻿program (see page 164 in the program binder)﻿ are met you will have an opportunity to be listed on the website as a Certified Angel Intuitive ﻿Practitioner. Experience Angel healing designed for people who are sensitive souls and can feel other people's energy. Audio CD's, Angel Intuitive ﻿Practitioner Course Materials (168 pages) Binder, deck of angel cards, accredited certification, spiritual healing sent throughout the entire process, and a copy of Dr. Kelli's book, Angels Are Always All Around You. Includes if necessary, one private session with Dr. Kelli to discuss any questions or if preferred, email support. Yes, Dr. Kelli, I am ready to put your Angel Intuitive﻿ Practitioner Home Study Program to work in my life for positive change! 100 percent!